New Zealanders are passionate about their four-wheel drives. These vehicles have developed their own particular status in our culture, the mark of someone who relates to an outdoor life and who savours the freedom of being out beyond the edge of town. And it is a deserved status,... read full description below. New Zealanders are passionate about their four-wheel drives. These vehicles have developed their own particular status in our culture, the mark of someone who relates to an outdoor life and who savours the freedom of being out beyond the edge of town. And it is a deserved status, as New Zealand offers fantastic opportunities for off-road touring. Following on from the successful book Out There: South, where the authors described a journey through the remote South Island landscape, this book is the record of a four-wheel drive adventure through some of the most spectacular country to be found in the North Island. Leading photographers Chris Morton and Tony Bridge have chosen to explore a series of dramatic landscapes spread through the North Island. Their objective was to portray something of the magic to be found off-road in the North Island from remote beaches and sand dunes to the isolation of the army land at Waiouru. Starting in the sands of Ninety Mile Beach and Parengarenga on the upper North Island's west and east coasts over a period of some weeks they journeyed through the dunes at Hokianga to exploring farm land in the Waikato and spending time high on Mts Tarawera and Ruapehu before finishing in farmland on the East Coast. While Out There: South was a remote journey in largely unpopulated South Island landscapes Out There: North was quite different as they became equally focused on the many people they met along the way in the more heavily populated North Island. 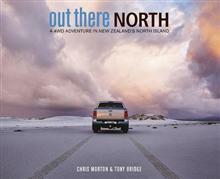 This book truly captures the romance and appeal of four-wheel drive adventuring in New Zealand, where there are a myriad of options to get away from the highway and close to the wild parts of this country. This is a must- have book for anyone who owns a four-wheel drive and wants to be inspired by its potential. After a successful career in engineering and property development, Chris Morton has devoted himself to photography in recent years. Most recently he has been heavily involved in the Our Place World Heritage Project and the book related to that as well as Out There: South and other personal photography projects. Tony Bridge was a high school teacher for many years before following his passion into fulltime photography. Not only is he well known for the quality of his images, but also he has an international reputation for his photographic teaching and mentoring.